MyGuru GMAT tutors do not begin instructing any students without having a tailored study plan prepared. Our students receive customized guidance on how to get ready for this unique exam given their specific situation, and are always certain of what content they need to read, problems they need to complete, and full length practice exams they need to take in order to maximize improvement. Below is a sample plan for someone taking the GMAT in one month who is able to meet twice a week and dedicate at least two hours a day to GMAT prep. For students who may be working full-time or are otherwise unable to dedicate that much time on a daily basis, a longer calendar would be recommended. 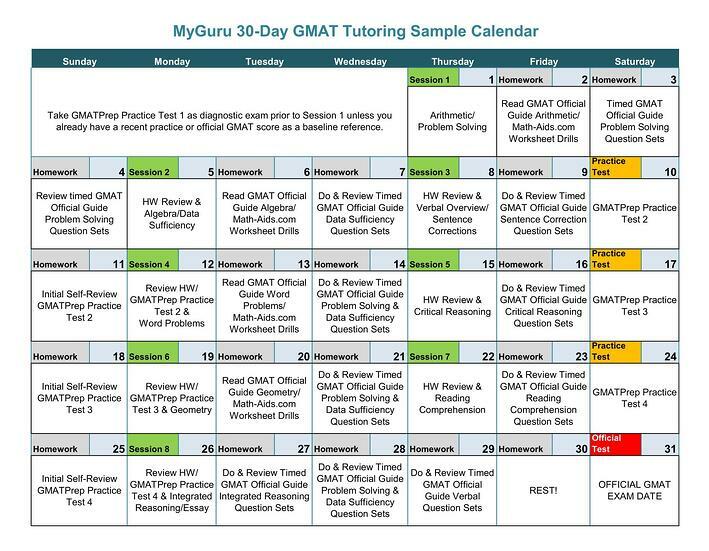 You can also download this 30-day GMAT study plan.